With the ESPN EZ Fold 2-Player Basketball Game, you can play alone or simultaneously with a competitor. The Electronic LED Scoring System with authentic arcade sounds gives shooters the adrenaline rush of a packed fieldhouse as they compete in 8 different skill games. When the weather or the time necessitate indoor activities, look no further than the ESPN EZ Fold Basketball Game. It keeps your shooting skills sharp and helps younger players develop hand-eye coordination and fine motor skills. Our innovative EZ Fold design lets you enjoy competitive, skill-building basketball shoot-outs at any hour and in spite of inclement outdoor weather. 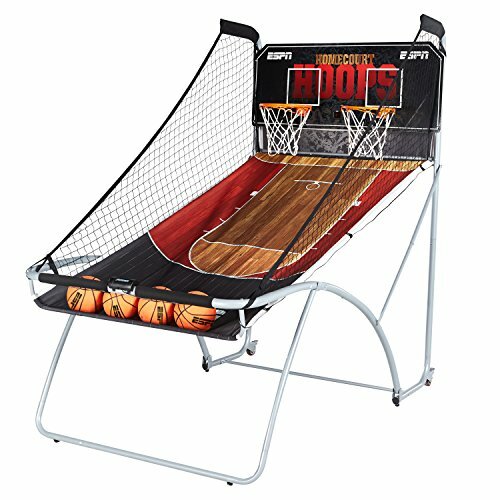 When not in use, the ESPN EZ Fold Basketball Game folds down to nearly half its size and takes up minimal space in your garage or guest room. The rust resistant 1.5"" steel frame is lightweight and enhances the game's portability. With 3"" lockable casters, it rolls on tile, carpet and wood floors for easy transportation. This set comes complete with 4 basketballs and an air pump. We insist on the highest quality materials and manufacturing processes to bring you this deluxe arcade style basketball game. We confidently offer a 30 Day Money Back Guarantee for your peace of mind. In the unlikely event that our product does not meet your expectations, return it for a 100% refund of your purchase price. No questions asked. Provide hours of home entertainment for your family and friends. Add the ESPN EZ Fold Basketball Game to your cart today. SPACE-SAVING DESIGN offers improved storage solutions when not in use. Lockable 3" casters promote easy transportation, and the sturdy 1.5"metal frame weighs just 51 lbs for enhanced mobility. 30 DAY MONEY BACK GUARANTEE ensures your satisfaction. If your family doesn't get hours of enjoyment from this challenging indoor basketball game, return it for a full refund of your purchase price. If you have any questions about this product by ESPN, contact us by completing and submitting the form below. If you are looking for a specif part number, please include it with your message.